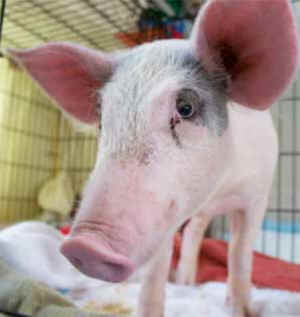 Thank you Pigs Peace Sanctuary and to the man who rescued Elsie from the highway. So sad the other piglets met such a terrible fate. This is a survival act. Elsie should live a long and happy life. The poor other piglets had no chance to enjoy life. They most probably went to the market and to be placed in small wire cages, never to see the sun or even play outside. They are made ready for the plate. I handreared two pigs and believe me, they are more intelligent than a dog. People only see a pig as something to kill and eat. These pigs (Priscilla and Babe) grew old and died a natural death. They were buried under a tree. Pig farmers dont even know the lifespan of a pig. Priscilla made it to 8 years and Babe was 6 when she died. Thanks Simone for Elsie's story and for organizations like Pigs Peace Sanctuary and people who go out of their way to show compassion to pigs. elsie is lucky and beautiful!!!!!!! but poor and sadness for the rest of the piglets!!!!!!! sad and tragedy. this man should be punish for animal cruelty. Sad? It is appalling that these piglets are crammed into little cages and that this put didn't even think about the fact that he was driving with animals in his truck. Really the only good thing is they did not suffer the harshness and degradation of living crappy lives until they were killed. It is sad that Elsie did not die but will not be able to live for a long time. I say shoot the man who killed these piglets. My tolerance for abuse gets lower every day. Though I must say she quite a stunner, hope hers will be a different fate than most of her kind! I have been a supporter of Pigs Peace Sanctuary for a long time. These intelligent animals are treated so poorly that it breaks my heart. I hope Elsie has a wonderful life for as long as she is able to. She should know that some people care and love her. Pig peace sanctuary will definitely be added to an organization I will donate too. I'm sorry to hear about the other piglets! So sorry about the other piglets. Perhaps the cages should have been secured or the other drivers not following so close and charged with animal abuse. God Bless all the animals in the world and those that love and care for them.